Chapter 1 Engineering Mechanics : What and Why? Thermodynamics is a perfect example of a science which is developed from axioms. In contrast to classical mechanics, thermodynamics has withstood the quantum revolution without having its foundations shaken. In the course of the century of its existence it sprouted only several vigorous offshoots: Nernst's Third Law, Section 12, the theory of dilute solutions, Section 15, the application of the Second Law to electricity and magnetism, Sections 18 and .19. We consider that the thermodynamics of irreversible processes, Section 21, constitutes a promising extension of the classical thermodynamics of equilibria; it is based on Onsager's reciprocal relations and attempts to describe real processes which occur at finite velocities. Even Kirchhoff, as related by Planck in his autobiographical paper (Naturwissen- schaften 19), restricted the concept of entropy to reversible processes; the firm belief in the general validity of this concept, which Planck stated as early as his doctoral thesis, led him in 1900 to his law of radiation and to quantum theory. 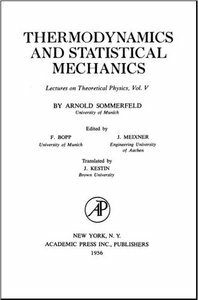 This classic text, first published in 1972, is designed for graduate physics courses in statistical mechanics. 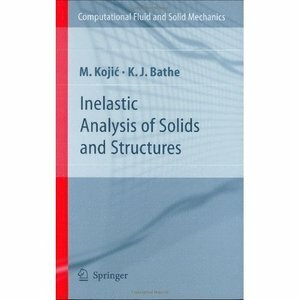 The second edition, published in 1996, incorporated three comprehensive chapters on phase transitions and critical phenomena. This third edition includes new sections on Bose-Einstein condensation and degenerate Fermi behavior of ultracold atomic gases, and two new chapters on computer simulation methods and the thermodynamics of the early universe. We have also added new sections on chemical and phase equilibrium, and expanded our discussions of correlations and scattering, quantized fields, finite-size effects and the fluctuation-dissipation theorem. 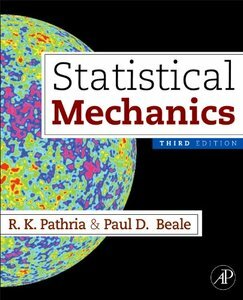 We hope this new edition will continue to provide new generations of students with a solid training in the methods of statistical physics. With Sabri Cetinkunt's Mechatronics, you can develop the technical background you need to design an automated machine, component, or process, as well as the practical judgment and knowledge of the current state-of-the-art technology you need to find the most effective solution. Drawing on knowledge and techniques from mechanical, aerospace, chemical, electrical and computer engineering, the text explores the theory behind a wide range of basic devices used in automated machines and processes--from gears and pumps, to servomotors and microchips. Various motion-control lab experiments bring together all aspects of the mechatronics field, and provide practical experience in designing circuits and writing software. * Reviews the basic concepts of kinematics and common motion conversion mechanisms. * Provides practical coverage of electronics, focusing on information non-electronics engineers need to know to analyze and design systems containing electronic components. * Offers comprehensive coverage of electro-hydraulic systems with real-world examples from the construction equipment industry. * Includes extensive and accurate coverage of all types of sensors, enabling you to work on any project that involves measurement and testing. * Discusses electric motors in detail, including DC motors, steppers, AC motors, and SR motors--key knowledge for designers of factory automation and robotic projects. * Covers microcontroller hardware and software issues, using PIC-18F452 microcontroller as an example. * Includes the often neglected topic ofprogrammable logic controllers (PLCs) which forms the foundation of factory automation. * The first textbook to cover the coordination motion control concepts as they are used in industry using state-of-the-art motion controllers and servo motors (i.e, applications in printing machines, coil winding machines, machine tools, and robotics). * Various motion-control-related lab experiments involve the construction of electronic interface circuits and the programming of real-time controls software. * Discusses modeling of mechatronic systems and components, control system design, analysis and simulation in MATLAB. * References real devices or components in examples and applications. * Provides a comprehensive list of supplies of components needed in mechatronic systems. As most modern technologies are no longer discipline-specific but involve multidisciplinary approaches, undergraduate engineering students should be introduced to the principles of mechanics so that they have a strong background in the basic principles common to all disciplines and are able to work at the interface of science and engineering disciplines. This textbook is designed for a first course on principles of mechanics and provides an introduction to the basic concepts of stress and strain and conservation principles. It prepares engineer-scientists for advanced courses in traditional as well as emerging fields such as biotechnology, nanotechnology, energy systems, and computational mechanics. 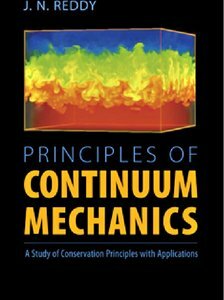 This simple book presents the subjects of mechanics of materials, fluid mechanics, and heat transfer in a unified form using the conservation principles of mechanics. Contains 12 papers dealing with the approximation of first and second order problems which arise in many fields of application including optimal control, image processing, geometrical optics and front propagation. Authoritative, comprehensive, convenient, detailed, Mechanical Engineers' Handbook, Second Edition, is the ultimate guide for the twenty-first century engineer. In a single, easy-to-use volume, it covers a broad spectrum of critical engineering topics and helps you understand the fundamentals, apply the technologies, and get the outcomes you want. With more than 70 0.000000e+00ntirely new or revised material, the Handbook keeps pace with rapid developments in materials, methods, and equipment--from concurrent engineering and TQM through virtual reality, advanced and composite materials, ergonomic design factors, electronic packaging, and many more major topics. 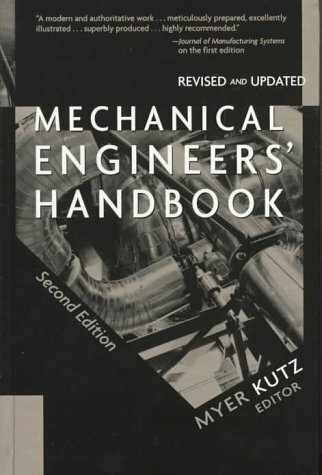 No other mechanical engineering guide matches this Handbook's array of crucial information and special features, including: * Authoritative contributions from more than 80 leading experts in industry, government, and academia * 26 entirely new chapters--including 9 new chapters on mechanical design * A key section on manufacturing engineering--a handbook within a handbook--with 4 new and 5 revised chapters * 7 new chapters on management, career, and legal issues * More than 1,300 useful charts, tables, photographs, and illustrations * Extensive cross-referencing and indexing for ease of use and searchability * Detailed, up-to-date reference sections at the end of each chapter * Directions to online databases and other information sources Whether you're looking for details on materials, any aspect of mechanical design, manufacturing, thermal engineering, or engineering management, Mechanical Engineers' Handbook, Second Edition, gives you fingertip access to the vital information you need to succeed. 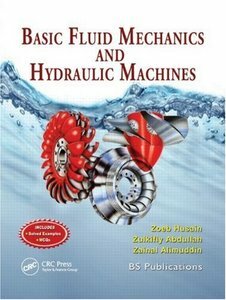 This text provides the student and professional mechanical engineer with a reference text of an essentially practical nature. It is uncluttered by text, and extensive use of illustrations and tables provide quick and clear access to information. It alsoincludes examples of detailed calculations on many of the applications of technology used by mechanical and production engineers, draughtsmen and engineering designers. Although mainly intended for those studying and practising mechanical engineering, a glance at the contents will show that it is also useful to those in related branches of engineering such as production, marine, offshore, mining, mineral and inparticular that of design. This reference book provides engineers with a wealth of useful material in a very compact and quickly accessible form. clear presentation and quick access to information very practical material, readily applied highly illustrated to aid understanding. As environmental concerns have focussed attention on the generation of electricity from clean and renewable sources, wind energy has become the world’s fastest growing energy source. The authors draw on substantial practical experience to address the technical, economic and safety issues inherent in the exploitation of wind power in a competitive electricity market. Presenting the reader with all the relevant background information key to understanding the integration of wind power into the power systems, this leading edge text:Presents an international perspective on integrating a high penetration of wind power into the power systemOffers broad coverage ranging from basic network interconnection issues to industry deregulation and future concepts for wind turbines and power systemsDiscusses wind turbine technology, industry standards and regulations along with power quality issuesConsiders future concepts to increase the penetration of wind power in power systemsPresents models for simulating wind turbines in power systemsOutlines current research activitiesEssential reading for power engineers, wind turbine designers, wind project development and wind energy consultants dealing with the integration of wind power systems into distribution and transmission networks, this text would also be of interest to network engineers working for power utility companies dealing with interconnection issues and graduate students and researchers in the field of wind power and power systems. PART A: THEORETICAL BACKGROUND AND TECHNICAL REGULATIONS. 2. Historical Development and Current Status of Wind Power (T. Ackermann). 3. Wind Power in Power Systems: An Introduction (L. Söder & T. Ackermann). 4. Generators and Power Electronics for Wind Turbines (A. Hansen). 5. Power Quality Standards for Wind Turbines (J. Tande). 6. Power Quality Measurements (F. Santjer). 7. Technical Regulations for the Interconnection of Wind Farms to the Power System (J. Matevosyan, et al.). 8. Power System Requirements for Wind Power (H. Holttinen & R. Hirvonen). 9. The Value of Wind Power (L. Söder). 10. Wind Power in the Danish Power System (P. Eriksen & C. Hilger). 11. Wind Power in the German Power System: Current Status and FutureChallenges of Maintaining Quality of Supply (M. Luther, et al.). 12. Wind Power on Weak Grids in California and US Midwest (H. Romanowitz). 13. Wind Power on the Swedish Island of Gotland (C. Liljegren & T. Ackermann). 14. Isolated Systems with Wind Power (P. Lundsager & I. Baring-Gould). 15. Wind Farms in Weak Power Networks in India (P. Sorensen). 16. Practical Experience with Power Quality and Wind Power (Å. Larsson). 17. Wind Power Forecast for the German and Danish Networks (B. Ernst). 18. Economic Aspects of Wind Power in Power Systems (T. Ackermann & P. Morthorst). 19. Wind Power and Voltage Control (J. Slootweg, et al.). 20. Wind Power in Areas with Limited Transmission Capacity (J. Matevosyan). 21. Benefits of Active Management of Distribution Systems (G. Strbac, et al.). 22. Transmission Systems for Offshore Wind Farms (T. Ackermann). 23. Hydrogen as a Means of Transporting and Balancing Wind Power Production (R. Steinberger-Wilckens). PART D: DYNAMIC MODELLLING OF WIND TURBINES FOR POWER SYSTEM STUDIES. 24. Introduction to the Modelling of Wind Turbines (H. Knudsen & J. Nielsen). 25. Reduced-Order Modelling of Wind Turbines (J. Slootweg, et al.). 26. High-Order Models of Doubly-Fed Induction Generators (E. López & J. Persson). 27. Full-scale Verification of Dynamic Wind Turbine Models (V. Akhmatov). 28. Impacts of Wind Power on Power System Dynamics (J. Slootweg & W. Kling). 29. Aggregated Modelling and Short-term Voltage Stability of Large Wind Farms (V. Akhmatov). Describes modeling and simulation strategies for alloy selection and mechanical property design. Illustrates designs for various components and fastening systems. Considers tribology and the design of surface engineered materials for cutting tool applications.